Hi Everyone! This past weekend, Stephanie Grace Designs was featured at the "Festival of Brides" wedding show at the Biltmore Hotel in Los Angeles. We did a fabulous set up (will post pictures later today) with floral chandeliers in purple and red. 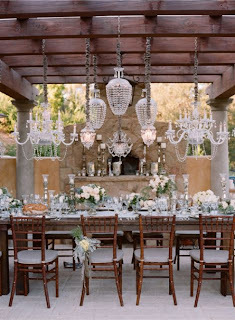 I absolutely love chandeliers and think they add complete drama. I think they can be used in many different ways, with flowers and without. I love using them as a centerpiece, with flowers adorned throughout, but I also love them just hanging in their simplicity and beauty. I saw on another blog the beautiful wedding of Elizabeth Messina, the famous wedding photographer. 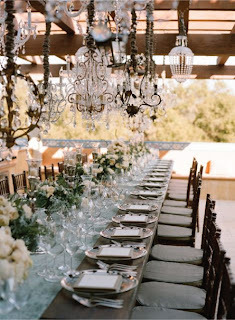 For her wedding, she used thirty stunning antique and new chandeliers, which truly gave the table drama and elegance. I think just the perfect touch to her day. wow, this is so lovely!